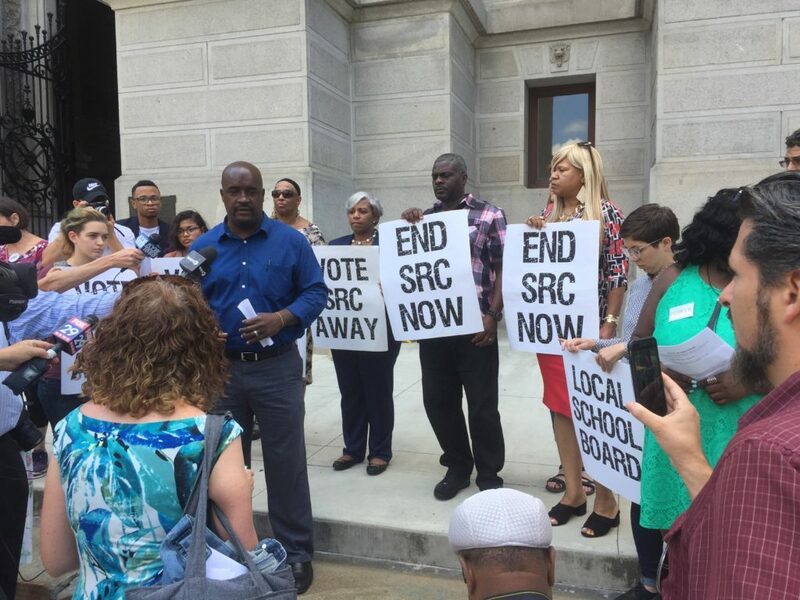 PHILADELPHIA — On Wednesday, August 9th at noon, members of the Our City Our Schools coalition held a press conference, calling on Mayor Kenney, Governor Wolf and SRC Commissioners to call the vote to abolish the School Reform Commission this coming Fall 2017. Two weeks ago, members of the coalition met with Jim Engler and Otis Hackney from the Mayor’s Office and asked for a public commitment to sign on to the Our City Our Schools timeline that calls for abolition of the SRC by the Fall of 2017. The Mayor’s office has yet to respond to the demand. Throughout the summer, the Our City Our Schools coalition also met with SRC Commissioners Wilkerson, McGinley and Richman, who expressed support. However, Chair Wilkerson has yet to put abolishing the SRC on a meeting agenda. The press conference included written statements from Councilwoman Helen Gym and State Representative Chris Rabb. Members of Councilpresident Darrell Clarke’s staff were in attendance; in June, Councilpresident Clarke also restated his support for abolishing the SRC. The Our City Our Schools coalition is made up of parents, educators, community members and students all fighting for local control of the Philadelphia schools and the end to the state-controlled School Reform Commissions. The coalition includes: POWER, Philadelphia Federation of Teachers, Philadelphia NAACP, 215 People’s Alliance, Taxi Workers Alliance, AFSCME DC 47, AFSCME 1199C, PASNAP, Philly Student Union, UNITE HERE Local 634, Parents United for Public Education, Reclaim Philadelphia, AFT Local 2026, Teacher Action Group, Caucus of Working Educators, Alliance for Philadelphia Public Schools, Neighborhood Networks and the Media Mobilizing Project.